If you're traveling to Greece from the United States, you will need an electrical adapter to use the wall sockets and charge your electrical devices. 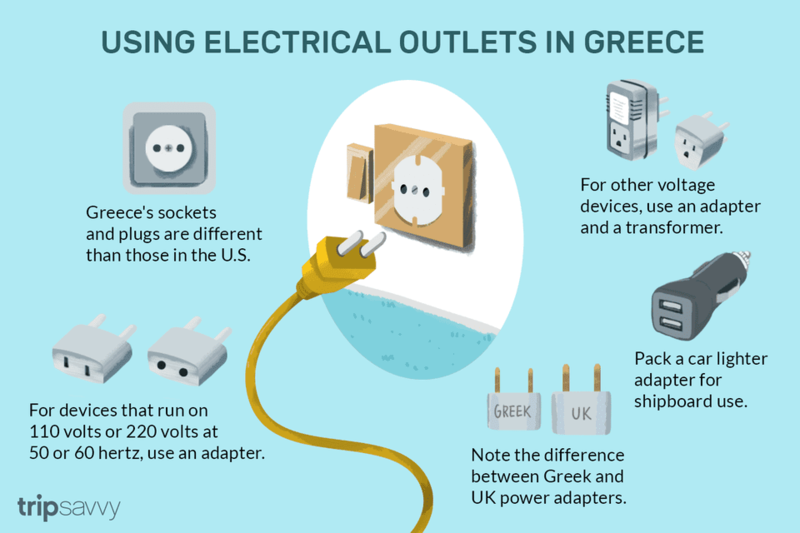 Greece uses different plugs than the United States. If you look at an outlet in Greece, the most important thing to notice is the two round holes. That's what you need to plug into. But there are two different sizes of round plugs used in Europe. Make sure you have the one marked for Greece or for southern Europe, sometimes abbreviated "So. Europe." The two brass prongs seen here may be absent from a wall outlet. You will need to get a power plug adapter in Greece. In many cases, you will not need a power transformer, just the adapter. You may also want to pick up a Greek extension cord at a street market or shop. This is the plug end on a standard, multi-outlet Greek extension cord. As an extension cord, it's actually a bit heavier-duty than your standard Greek-made electrical device. If your device can run on either 110 volts or 220 volts at 50 or 60 hertz, all you need to use it in Greece is one of these adapter plugs. This covers most modern laptops, cell phone chargers, hair dryers and many other devices, but read the information on your device to be sure. However, if your device is picky about power, you'll need to bring a heavier transformer plus a plug, if it does not have the attachment built into it. Most modern consumer electronics just need the adapter plug, but if you're carrying specialized medical or other equipment, you may still need a transformer to massage the electricity so it doesn't blow out your device—or all the lights on your floor of the hotel. The downside of not knowing for sure? If you use a transformer for a device that doesn't need one, you may blow out the lights, melt your device and plunge the whole hotel floor into darkness. There are two similar types of adapter plugs. The Greek one has prongs that are slightly slimmer. You can often find a list of the areas where a connector can be used printed on the actual adapter plug. Note the "So. Europe" designation, which in this case includes Greece. Some yachts, ferries and small ships in Greece may not have the usual power outlets and you might want to bring an adapter with a "car lighter" style attachment. These can also be handy if you are planning on doing a lot of travel by rental car in Greece, as you can charge your cell phone and other devices. This tip is especially useful for an island-hopping yacht trip on a vessel that only has this kind of plug in the cabin. It happens all the time. You mention you are going to Greece and a helpful friend or neighbor offers you a power adapter from their own trip to Europe. It looks to be the right plug, but you get to your destination and discover it doesn't work. Those thicker prongs just won't go into a Greek electricity socket, even though they look as if they should. A Greek power adapter is not the same as the UK one. Look closely and you can see another angle of the differences between northern European/UK adapter plugs and the southern European style that is used in Greece. 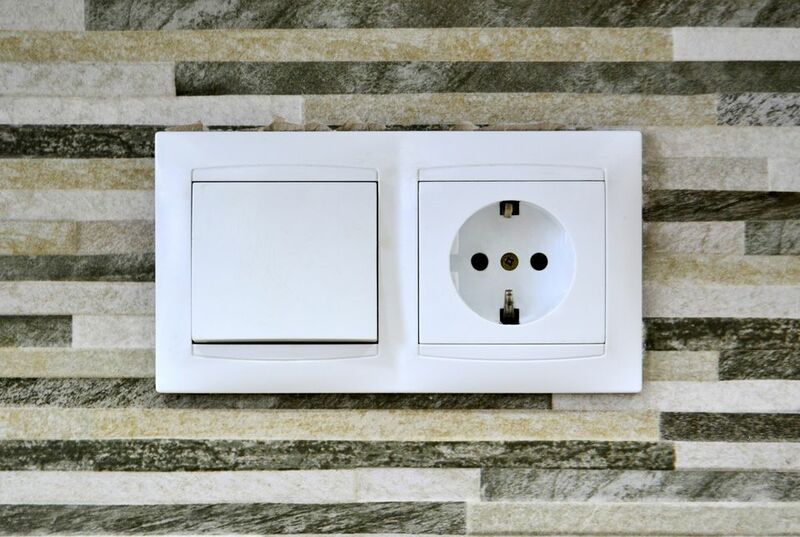 Some Greek wall outlets have deep sockets—so deep that the American plug end on your device may keep the adapter plug from fitting into space. Always bring several plug adapters with you. They can be connected together to give you an extension, providing enough room for your device to fit. Since it is also easy to lose them and it's nice to be able to rescue a traveling companion who forgot or already lost theirs, pack more than you think you'll need. You can also look for convertible-style adapter packs that have a wide assortment of different plugs in one kit. Multi-plug units can be useful, especially if you are traveling across Europe. The problem is that many plugs abroad are set into the wall, often quite deeply. And most of the multi-plug units assume that you will be able to plug into a nice, flat wall. The result? You may have the right adapter plug for Greece, but you still may not be able to insert it. And if you are only going to one country at a time, you could carry at least three or four individual power adapter plugs in the same space​—and with less weight—than the multi-plug unit. Plus, having a spare plug or two protects against loss, allows you to lend one to another traveler and also allows you to charge more than just one thing at a time. Buy what you need before you travel. Often, power adapters are hard to find in Greece or your destination country. Online: Make sure the one you purchase is for "Southern Europe" or "So. Europe" and that it clearly states it works in Greece. Email the seller to make sure, because even if there is a clear picture of the item, it is almost impossible to tell from photos if the poles are the thinner, Greece-friendly variety or the thicker British variety. Home electronics stores: Big-box home electronics stores often carry international travel plugs. Luggage stores: Check the travel accessories display. Find power plugs and other travel gadgets to buy for Greece. Book your own ​Day Trips Around Athens.